Google Earth does a mighty fine job showing the essence of crazy interchanges, but if you really want to know how ridiculous interchanges can be, check out the underneath view. 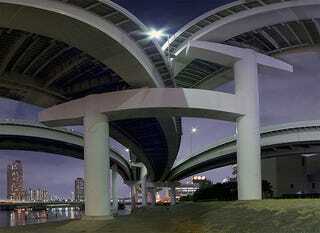 These interchanges don't come from China, but rather the neighbor of Japan. Ken Ohyama is the man that has captured some of Japan's most efficient traffic clusterfucks. Not only do you get to see the underside of these engineering marvels, but Ohyama is pretty damn good photographer, as well. Check out the gallery below with some of his select works or follow the link to see the entire Flickr set.